ROME (CNS) — The simple songs using phrases from the Psalms repeated over and over form a frame around the 10 full minutes of absolute silence that lies at the heart of the Taize ecumenical community’s prayer. 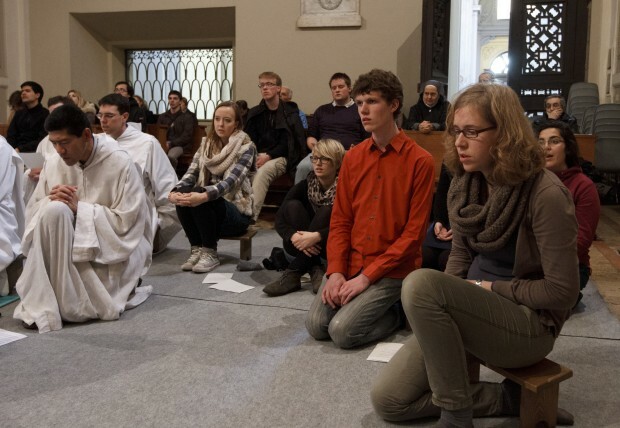 As monks from the community, based in France, and volunteers prepared to welcome more than 30,000 European young adults to Rome Dec. 28 for the annual “pilgrimage of trust,” they gathered each afternoon for several weeks at the Basilica of St. John Lateran to pray. The young people and the monks will share their prayer with Pope Benedict XVI as well. Msgr. Guido Marini, master of papal liturgical ceremonies, told Catholic News Service that the pope will join the young people for Taize prayer Dec. 29 in St. Peter’s Basilica. The community was founded by Brother Roger, a Swiss Protestant, in 1940. After World War II, his vision was for the monastery to be a place of welcome and reconciliation, especially between Christians of different denominations. The community now has about 100 monks from 25 different countries; about half are Catholic and half are Protestant. In the 1960s and ’70s, Brother John said, young people just started showing up — lots of them. And they are still coming. The founder, “Brother Roger, said, ‘This is important. If these young people are coming, they are searching for something and we need to respond,'” Brother John explained. The community does not just wait for the young people, though, it goes out to them. Since 1978, “the pilgrimage of trust” has been held in cities all over Europe, bringing people 16-35 years old together Dec. 28-Jan. 2 for sharing, discussions and, mainly, prayer. The young people will gather twice a day at the major basilicas of Rome; organizers also have set aside the Basilica of the Holy Cross of Jerusalem for silent prayer and confession or a simple heart-to-heart with a priest or brother. At DePaul University in Chicago in late May, the brothers began a similar prayer experience for young adults in the United States. In 2013 the Memorial Day weekend pilgrimage will be held in Red Shirt, South Dakota, on the edge of the Pine Ridge Indian Reservation. The fact that young people still flock to Taize, France, and to its prayer gatherings shows that whatever else has changed in the world and in the lives of the young, “there is still a thirst in the young for meaning, for meaning in their life. Many young people today are worried about the future — their own personal future and the future of humanity,” Brother John said. “Young people, when they are exposed to it, can discover the importance of silent prayer, of going into themselves and opening their hearts to God,” he said. When he joined the community in 1974, Brother John said, the community’s prayer was all in French and it was “a more traditional monastic prayer,” but it was evolving. There is no set number of times the phrases, mainly from the Psalms, are repeated. At a certain point, a leader sings “Amen” and the congregation finishes the chant. Experience has shown the monks that “repetition can help you go deeper into prayer,” Brother John said. The long period of silence, he said, is key. “Many people find it hard to believe” that young people — so connected to computers, cell phones, portable music players of various kinds — could be so still for so long. For Brother Roger and for most of the monks today, Brother John said, reconciliation among Christians is a major motivation for their living and praying together: a life and liturgy marked by the simplicity, silence and scriptural focus that marked monasticism long before the Reformation split Europe’s Christian communities.